Noosa's Funnest Backpackers Hostel in the heart of Noosa town. Nomads Backpackers Noosa is a Hostel & Resort situated in the heart of Noosa opposite shops, banks, restaurants, post office and cinema and it's only 800m to Noosa Main Beach and famous National Park. Backpackers can choose from dorm share, twin share and double rooms. 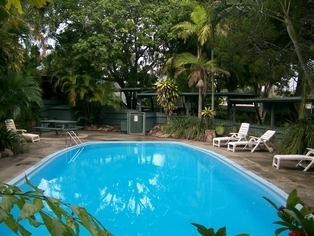 The accommodation at Nomads Backpackers Noosa (formerly known as Koala's Beach resort Noosa) is surrounded by tropical gardens with direct access to the resort pool and volleyball court. Nomads Noosa Backpackers Hostel & resort offers you plenty of entertainment. With an onsite bar and restaurant with lots of nightly backpacker drink specials you can afford to treat yourself ! Enjoy our nightly Happy Hour and silly games such as theme nights (Toga parties), Quiz Nights, Pool competitions and much more! 10 Share female only dorm with ensuite bathroom. Rate is per person per night. Fresh clean linen provided. 16 share mixed dorm with ensuite bathroom. Rate is per person per day. Fresh clean linen provided. 8 Share mixed dorm with ensuite bathroom. Rate is per person per night. Fresh clean linen provided. Nomads Noosa Backpackers Hostel is found right in the heart of Noosa, 800m from the beach.